Thomas Evans Watts was the son and namesake of Thomas Evans and Josephine Taylor Watts. He was born February 15, 1926, and died on May 8, 2013, at the age of 87. In addition to his parents, he was predeceased by his wife, Clara Sue Smith Watts, in 1968; one sister, Ada Lee Watts Smith and her husband, James F. “Jimmy” Smith; brother-in-law, Thomas E. Ladd; and son-in-law, Micky Ligon. He is survived by his wife of 43 years, Mary Louise (Weegie) Cook Watts; one son, Thomas E. (Tombo) Watts, Jr. (Debbie); one daughter, Susan Lee Watts Ligon; three grandsons, Thomas E. (Evan) Watts, III (Lacey), Jordan Thomas Ligon (Jana), Grant Taylor Ligon (fiancée, Brittnay Nash), and step-grandson, Jeremy Perdue and three granddaughters, Whitney Claire Watts Faires (Ben); Leslie Jo Ligon, Mary Susan Ligon Hilton (Peter); two great grandchildren, Ellie Claire Faires and Wyatt Grantham Ligon; and one step great-granddaughter, Shannon Perdue. Tom, also known as Tommy, was born in Camden, Arkansas, and lived there all of his life except when in college and the armed service. His parents enrolled him in the Cradle Roll Department of First Baptist Church when he was five days old, and he has been an active and faithful member of the FBC Sunday School since that time, serving the past 40 years as an adult class teacher, and the previous 20 years as a teacher and leader of children’s classes. At the age of 12, Tom committed his life to Christ as Savior and was baptized into membership of First Baptist Church. Tom served as a Deacon at FBC, Camden, for 60 years, was on the finance committee and served as chairman several years, and Treasurer of the church for 20 years. 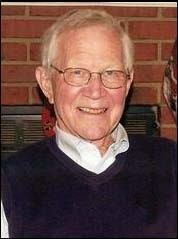 He also served on the Arkansas Baptist Foundation Board for several years. He attended Camden schools and graduated from Camden High School, class of 1943, receiving several scholastic and leadership honors during his school years. He attended University of Arkansas (Fayetteville) and graduated from Tulane University with a BBA degree. He volunteered for the Navy and was called into service on his 18th birthday. He was discharged as Lt.(jg). He was active and involved in civic and business committees and activities such as Camden Jaycees, served as president; the Camden Rotary Club for 30 years and served as president and Paul Harris Fellow, Chamber of Commerce Director, Main Street, Camden, and participated in Camden Community Chest and other charitable endeavors and drives. He served as a Director of M & P Bank (now BancorpSouth). He was on the Camden Civil Service Commission for 24 years. Tom retired in 1989 and sold his business to his son. Tom enjoyed retirement and maintained an active and involved lifestyle. His recreational interests were a lifetime enjoyment of golf, Razorback sports, and recreational trips. Although not a gifted athlete, he was lucky enough to have made eight holes-in-one, having made at least one on each of the five par threes at Camden Country Club. Seeing his family and grandchildren mature, be educated, with careers, and contributing to society have been very meaningful to him. He departed this life very appreciative of his family, his golfing buddies, his good neighbors, and the many, many friends who made this world a wonderful and enjoyable place to be and who gave him more than he could repay. Burial will be held at Greenwood Cemetery on Friday, May 10, at 12:30 PM and a memorial service will be held at First Baptist Church at 1:30 PM Friday. Family and friends are welcome to come to either or both the burial and memorial service. Following the memorial service at the church, a reception will be held to allow people time to visit with the family. There will be no formal visitation time at Proctor Funeral Home, but the funeral home will be open until 9:00 PM Thursday for those who wish to stop by. The family will receive guests at the home on 1251 Mary Street. Memorials may be made to the First Baptist Church, 348 West Washington Street, in Camden or to a charity of donor’s choice. Proctor Funeral Home is in charge of the arrangements.